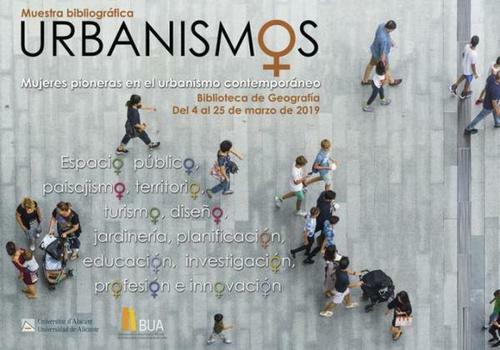 The Geography Library, in collaboration with the "Área de Urbanística y Ordenación del Territorio" , organizes the URBANIMS bibliographic sample on the occasion of the International Women's Day. Contemporary urbanism women pioneers, which will be located at the library entrance from March 4th to 25th, 2019. Architects, urban planners, landscapers, sociologists, writers, researchers, designers, teachers, editors, officials, all versatile and all pioneers, daring, advanced for their time, inquisitive and nonconformist with the reality that surrounds them. The statement by Janette Sadik-Khan "when you change the street, you change the world" is in the philosophy of the work of these women, that of improving things on a local scale to influence others on a global scale. This exhibition has to be understood as if you were wandering around the city, where you find known spaces, places to discover or new views on spaces that you thought you knew in depth. Here, each book and each author are the elements of the urban plot. So, in this proposal, you should not stop revisiting the places you know, you can always find something different; Neither you have to adapt to the most common itineraries and, from time to time, you have to experiment and to let yourself go. Women that make up the places of this sample come from very different backgrounds and from eras far away in time (from Gertrude Jekyll at the end of the 19th century to contemporary authors of the 21st century) and with really different personal and professional trajectories. There is no planned temporal sequence, there is a selection of pieces for everyone to explore and build their own journey. Thus, the selection made wants to show the most professional aspects of these women activity: some of them innovate in the design, others use their inquisitive look as an advance tool in scientific knowledge, and also to to awaken consciences. Some of them have contributed to a better way of doing in professional practice, others write about other women's figure, and some women give visibility to an inequality that is not always perceived. They are not alone, but they are the visible head of a work team that includes other women and men, because the construction of scientific knowledge, as well as the city building needs multiple focal points, because the teams add up. These 20 titles deal with key issues and current issues in urban planning and the contemporary city. It is not a closed sample, but an open selection to grow within the funds of the Geography Library, available to the university community. The bibliographical selection prepared by the "Área de Urbanística y Ordenación del Territorio", is a diverse sample in terms of subject, matter, content, form and ideology, just as the funds of our reference library are.